Hello, thanks for doing this interview, Can you please tell us about yourself? Who are you and what do you do? Psychoz: Hi, my name is Zoran Zlatkovski & my project name is Psychoz. 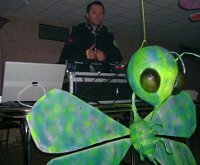 The project was born 12 years ago when I decided to produce only psy-trance, experimenting before with many musical styles like break beat, techno, drum and bass, house, and other variations of electronic dance music. 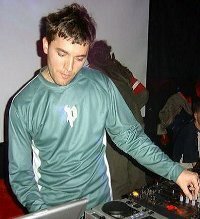 When I first started to produce psy trance it was first Goa in the beginning like all the Psytrance which was made around in the middle 90ties, few years later I changed my music into more experimental Psytrance when my first album for Avatar was released, and same year one experimental tribal trance CD from my White Teeth Project. 3 years after I was making a break finishing my studies and after that I dedicate to start producing music again this results in new album one year later for Trishula Records. Since that time when my album for Trishula was released I start to be involved more than before in music production which resulted with my album Psychotic Epiphanies one year after and a lot of tracks on compilation. Since this year 2006 when my album Spirits of the Dead for Trishula was released I released more than 40 tracks on VAs from which I’m very proud and represent what I have been working in the last 3 years. 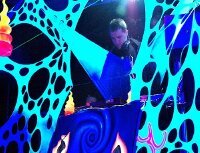 How did you get into goa/psychedelic trance? At what age did you get into it and when was your first party? Psychoz: I was 16 when I first attended on a trance party in the city where I’m born and where I live Nürnberg, it was the very first goa party of some of my friends from Nürnberg which are not active at the moment but are helping me sometime nowadays when I make some party there alone or with my friend Fabiuz also producer from Nürnberg. When the Psychoz project was born what were the main influences behind the project? Psychoz: Well cause all the Psytrance movement in the beginning when my project was born was Goa its normal that was that style that time, but later when the music changed I changed my style too depending of how i was feeling and thought is more up to date and the Psy people like to hear from me.I got more knowledge than before in music production so it was easier for me to make any type of sound I want. I’ve been producing all kind of Psytrance in the past years from Goa to minimal Psytrance, Progressive, Dark, Full on, Morning, Forestand Ambient Psytrance. What gear do you use to produce music? Do you think there is a big difference between hardware and software? Psychoz: I was working 6 years in logic platinum 5.5, before the next version was released I switched to Cubase SX and I’m still working on it I use still logic 8 and Ableton time to time. The difference in sound is of course not big the only main thing is the way of work the touching factor ,you can use your both hands and work with real knobs, for some people this way is faster, for me its the same I never made big difference all those story about hardware is better and has better sound engines maybe are true to few analogue synthesizers in which I enjoy working like Nord Lead, all types of Access Virus (TI, Polar etc),also I like Roland and some Yamaha synthesizers a lot but in general the sound is the same if you know how to work with it. 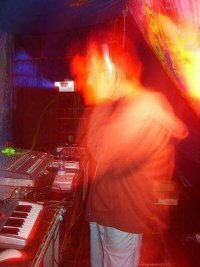 I used to use a lot of hardware in the past when I was working for a 2nd shop for instruments in Skopje when I lived there few years and I used a lot of real analogue synthesizers including the old Juno 106. I always enjoy working with hardware and if I can choose I would work only with hardware even if the difference is almost none you can get great sound from both if you know how to use them. 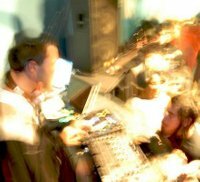 Psychoz: The only side project I had when I start producing Psytrance was White teeth which was much more different from my Psychoz project which was the reason to choose different name, but right now I’m only concentrated in my Psychoz project exploring different types of Psy sounds and unique Psychoz sounds. Can you tell us a bit more about your upcoming Split Vs album with Jeto? Psychoz: That’s a really a good question. The album is almost finished; I hope will see the light of the day next summer. There are few more tracks to be finished and the album will be sent on mastering. The collaboration was born very spontaneously after I did a track with Jeto for the Kagdila Records VA Time Spiral in his Los Angeles studio last year and we decided to make few more tracks together and release an album, which we both think and expect that people will love to hear knowing the fact that all the sound is made in his great studio in Los Angeles containing all the latest analogue synthesizers and newest modern electronic equipment. What's it like working with other musicians? How do you normally split the work? Psychoz: Usually the best is to work together realtime and same time like most of this album with Jeto is done in LA in his studio together, but if its not possible I use the net when making VS with artists, usually one make half of the track and than the other finish it. The VS work is always very exiting and challenging cause there are more different ideas and more variations. What kind of story are you trying to tell in your latest albums "2012 There is No Return" and "Morning Glory”? Psychoz: Both albums are released almost at same time but since they are very different from each other the labels who released them didn’t feel any problem with that. 2012 is a dark epic album which is inspired from the 2012 saga and is made in this direction while the 2nd one is light pumping morning full on album with few down tempo morning tracks. In the upcoming compilation "Time Spiral" on Kagdila Records, the style has changed a lot from your solo albums and compilations. What brought this change? Psychoz: All my albums and trax in general are very different from each other. My last 2 album before 2012 and Morning Glory were both dark same like most of the tracks I released on the VAs last 3 years and all my 3 EPs are dark thats why most people think my music is dark but my first album for avatar is very light and also I have 2 morning track on my Trishula records album called Aurora. The album Morning Glory is mostly light fullon album same as the split album with Jeto and I think that in future my music will be lighter directed too. Do you have a preferred time to play at parties & festivals? Psychoz: I never choose time and I never have any complains about it. I prefer to play 2 or 3 hours which I think is the best time to represent all my latest music. I don’t mind playing any time or even last closing the party with my with my morning set or continue the party sometime after midnight with my dark or full on set ,it all depends of what people and the organization team are making and wants to hear and are expecting from me, I’m always there to do the best I can. When not producing or DJing what kind of music do you like to listen to? Psychoz: I like from Tampa the death metal scene a lot bands like cannibal corpse, 6 feet under, death, obituary, deicide etc... also some bands from UK like caracas, napalm death, sod etc… few bands from LA like megadeth,ministry, nine inch nails, marylin manson ,old stuff from the 70ties like alice cooper,the stanglers,fleetwood mac etc .I used to play in many bands before I start with electronic music and Psytrance from my 10th year of age I played in many different rock, metal, punk, industrial and alternative bands. When I was 10 I played bass until 13 when in 2 punk bands than I switched to guitar until my 18 year when I concentrate only in producing Psytrance which is the only music i produce now, so i can say i had a lot of influences from all this rock,metal,industial,punk this in the music I was making. Psychoz: I would like to thank everyone who has been paying attention in my music in past years and is still following what I’m doing. Expect a lot more music from me in the future. Good Luck and thanks for the interview.